My husband has qualified us as “the nerds that other nerds pick on.” Why, you may ask? Because we listen to other people play table top role playing games for entertainment. I am perfectly okay with being that nerd. A few months ago Logan discovered the podcast One Shot and we’ve been listening to the group in some form ever since. I recently went back and started going through the archives and I’m a little hooked. 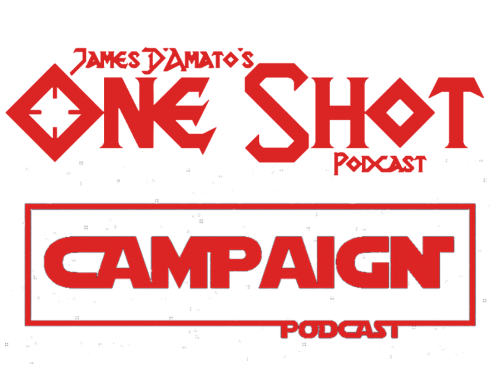 One Shot is a podcast hosted by James D’Amato and Kat Kuhl who alternate running and playing in games with guest improve actors, podcasters and table top developers and enthusiasts. They play basically any kind of system or game they can get their hands on from the classic and ever popular Pathfinder to more obscure systems like Dead Scare and Feng Shui. The idea is to test out different systems and games and settings and see how they play and have some fun along the way. While I have to say it’s not always appropriate for all audiences, it is always entertaining. I realize some of you have already jumped ship on this one, but stick with me if you will while I go deep into my nerd zone. This is not the first rpg podcast but it is the one I like best. We listened to another for a while and it was entertaining enough, but also super ridiculous. The group was made up of comedians who were more interested in goofing off and being funny than actually playing the game and it took the whole thing in some super weird directions. What I love about One Shot and the Campaign that’s associated with it is the players are taking the system seriously, they’re following the rules and working in the system and happen to also be funny and have fun along the way. Every move is meant to propel the story, they don’t derail the plot for their own amusement. I appreciate the respect they have for the systems and the people who created them and are running them. I never feel like I’m listening to a bunch of teens harass their gm friend. The great thing about listening to One Shot is the story telling. As improve actors they focus very heavily on telling a story that fits their characters. I love the story aspects of role playing, but not always dealing with the mechanics. This way I can enjoy the stories that are created through playing and not worry about the dice. I will admit, though, that I do enjoy hearing them deal with the dice and understanding what it means when they make a positive or negative exclamatory noise. It’s also a chance to see how other systems play without having to find the time and people to play with, which is the biggest obstacle for me trying new games. I really want to try some of the games they’ve played in person. The Star Wars system sounds like a lot of fun and I wouldn’t mind playing in a zombie apocalypse set in the 1950s some day. I also really want to play through a Steamscape campaign having listened to on of the more recent games. Everyone involved is great at getting into character and acting as that person the whole time. James and Kat are both awesome role players and game masters and bring a lot to every game they’re in. Kat is also the game master for the Campaign, a full length Star Wars campaign that sprung from a few One Shot stories. We’ve been listening to that as well and it is a beautiful thing. I have to admit, I’m a little in love with Kat Kuhl. She seems like the coolest person and I would love to be her friend. The group also produce a few other podcasts which are geared towards people with table top and role playing interests. There are podcasts on the rules and GMing advice and interviews with game designers and all sorts of cool stuff. They have a cool team now that know their stuff and are really passionate about what they do. I haven’t listened to all of the different podcasts on the site, but I’m working on it, and you should definitely check them all out, if this is your kind of thing. I’ve super enjoyed listening through One Shot and Campaign. Logan and I listen to Campaign together on long car rides, and sometimes short car rides so we can enjoy it together, but we can’t listen to One Shot together because we both really want to hear it and if we listed to both together we’d never listen to any of it. But we’re both really enjoying everything we hear. Like I said before, though, it’s not always appropriate for all audiences; sometimes profanity slips in there, and some mature themes pop up from time to time. But for the right listener, One Shot is a great podcast run by some really cool people. I definitely recommend checking it out!